This past summer Sony Pictures Entertainment promised the public they would be releasing a new comedy entitled “The Interview”. Co-Directed as well as starring are Hollywood “funny men” Seth Rogen and James Franco. The movie is a satirical comedy portraying the assassination of North Korean Dictator Kim Jong-un. 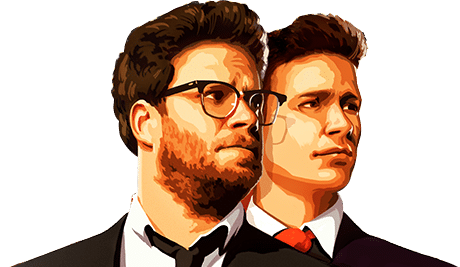 Rogen and Franco are no strangers to working together in off-the-wall comedies, as they also played together in films including “This Is The End” and “Pineapple Express” each having a considerable amount of success. In response, Columbia Pictures then pulled back the initial release date of Oct. 10, and pushed it back to Christmas Day, gutting the majority of the material that they felt as if would offend North Korea in the process. A month prior to the latest release date, a hacker group which was reported by the FBI to have connections within North Korea and go by the alias “Guardians of Peace” hacked into the computer servers at Sony Pictures Entertainment. Through hacking, the group was able to gain access to intricate Sony employee information, along with information regarding upcoming films the company plans to release in the upcoming year. The Guardians of Peace then leaked this internal Sony information for the entire internet to scavenge on. As time progressed, on Dec. 16 the Guardians of Peace began to issue terroristic threats aimed at any theater that planned on playing the movie on its release day. In return washing away all liability of safety concerns, major theater chains such as Regal Cinemas, AMC Theaters, and Cinemark were the first to opt-out of screening the film altogether due to the threats made by the Guardians of Peace, which then urged and eventually led Sony to cancel the theatrical release of “The Interview” on Dec. 17. With overwhelming criticism by the media, Sony released a statement regarding the Dec. 17 cancellation of the film by stating, “We respect and understand our partners’ decision and, of course, completely share their paramount interest in the safety of employees and theater-goers.” Though some smaller independent theaters across the nation decided to follow through with the release of movie, it looked as if the entire situation was a bust for Sony. Seven days after Sony released a statement saying they had no intentions on releasing the movie, they then turned their efforts into the complete opposite direction and announced they actually would be releasing “The Interview” digitally through online services on Dec. 24. Through services such as Google Play, YouTube Movies, Microsoft’s Xbox Video and Seetheinterview.com, Sony so far has made upwards of $31 million off the movie since. The follow through with the movie has had different reactions through movie critics and the public, with some enjoying it, some not so much, and some even coming to terms why North Korea wanted it to die out altogether. The true essence of the movie has taken on a life of its own since its initial debut trailer; an essence that not only transformed this satirical comedy into something larger, but something that represented creative expression coming face to face with terroristic threats and cyber-attacks. So even though the movie may only have a 51 percent rating on rottentomatoes.com, if all the controversy surrounding it didn’t add to its amount of international exposure and popularity, it’d be difficult to argue what did. Many people like to criticize Sony for not playing hardball with the Guardians of Peace in terms of the movie’s initial release. Many people also like to criticize Sony for allowing the movie to be created in the first place because of its depiction of the assassination of another nation’s leader. All in all, those who continue to criticize Sony are missing one of the biggest points embodied in this entire situation. Let’s say the movie was never released and Sony succumbed to the will of this anonymous hacker group, laying down the fight earlier in the ball game. If that were to actually happen, what precedent would it create for the future? A world where if anyone publishes or releases something not of the liking of a certain group, that death threats and cyber-attacks are the appropriate responses? If so you might as well render creative expression obsolete which is a hard pill to swallow for an entertainment company attempting to make a movie depicting the assassination of a controversial world leader.